Due to the severity of the regional climate, much of the glacier ice in the Canadian and Greenland high arctic is below the pressure melting point, particularly where mean annual air temperatures and glacier thickness are low (Koerner, 1989). In the northern part of the region, this results in some glaciers terminating in the sea as ice shelves (Koenig et al., 1952; Hattersley-Smith, 1957; Crary, 1958, 1960; Dunbar, 1978; Jeffries, 1987; Lemmen et al., 1988; Higgins, 1989; Weidick, 1995). Because melting is largely restricted to the glacier surface and englacial drainage routes, and because glacier margins are predominantly cold-based, the glaciers of the region are classified as sub-polar (Paterson, 1994; Benn and Evans, 1998). However, many larger outlet glaciers reach pressure melting point over extensive areas of their beds due to high ablation rates at their snouts, the trapping of geothermal heat and the initiation of strain heating by glacier flow. Such glaciers are polythermal in nature (Blatter, 1987). 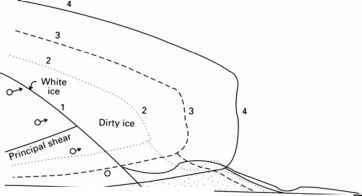 For example, the vertical temperature profile through the snout of White Glacier, Axel Heiberg Island, indicates melting temperatures at the bed (Müller, 1976; Blatter, 1987; Blatter and Hutter, 1991). Additionally, studies on John Evans Glacier, eastern Ellesmere Island, report meltwater at the glacier bed (Skidmore and Sharp, 1999; cf. Iken, 1972, 1974). Such results demonstrate that even the snouts of some glaciers in the region are partly warm-based for short periods during the summer. 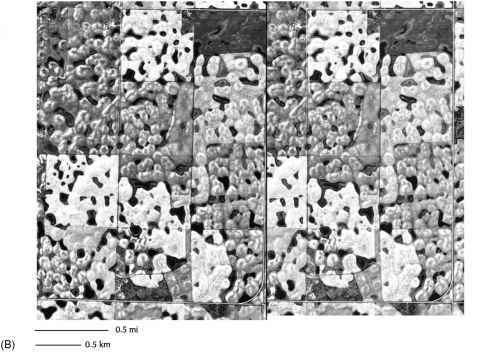 However, with respect to debris entrainment and glacial geomorphology, ice thickness and activity dictate the larger-scale trends in thermal regime and landform development. Specifically, glaciers with relatively high-mass turnover (e.g. southeast Ellesmere Island bordering Baffin Bay) and/or strong converging flow will contain the most extensive zones of warm-based ice. The thinner, slower moving ice of sub-polar glacier margins will be cold-based. Evidence for cold-based glaciers within the Queen Elizabeth Islands is manifested by the recent retreat of glaciers on southeast Ellesmere Island where intact dead plant communities are being exposed (Falconer, 1966; Bergsma et al., 1984). Long-term observations on the margin of the Greenland Ice Sheet at Nunatarssuaq record the response of ice cliffs to mass balance changes (Fig. 3.2). The change in the snout profile from a steep cliff during periods of positive mass balance, to a low-angle, debris-covered ramp during periods of recession, has implications for both debris entrainment by apron overriding and for supraglacial debris release and the production of buried glacier ice (Goldthwait, 1960, 1961, 1971). Glacier recession and snout thinning exposes large areas of debris-rich folia parallel to the ice-margin, resulting in the formation of supraglacial controlled moraines (see below). Surging glaciers have also been reported from the Canadian and Greenland high arctic (e.g. Hattersley-Smith, 1969a; Jeffries, 1984; Higgins and Weidick, 1988) and, based on our own observations, many glacier surfaces here contain looped and contorted moraines, which are usually interpreted to indicate surge activity. However, the geomorphic impact of such surging has never been investigated in the region. It is therefore possible that surge signatures are contained in the landform record of the region and this should be entertained in the explanations of process-form relationships outlined below. What are polythermal or subpolar glaciers?